A little friendly rivalry, especially over food, is always fun. Add a group of friendly people, and you’ve got a delicious blend. Our 4th annual chili cook-off is coming up on Sunday, January 13, 2019, and we are looking for chili cooks who are keen to make a pot of your best chili con carne for our friendly competition. Try something different! If you are an entomophagist, you would have loved one of our more daring entries in 2017 – roasted crickets and ground mealworm chili! And at our latest cook-off, we had a kangaroo-ostrich chili entry! Or try something safer, for instance vegetarian tofu chili, chili verde, white chili, pulled pork chili, black bean chili, chicken or turkey chili, chili con tuna, or chocolate bacon chili (the ultimate marriage of two of the tastiest foods!). We also need judges and fun-loving folks who just want to hang out, eat delicious chili, and play. We’re going to have nachos, fresh fruit and light desserts to complement the chili, so lots of food will be available. All attendees will have a chance to judge the entries, which is when the fun really begins! For attendees of all ages, after we taste-test and judge the entrees, we will have fun activities and board games for everybody. 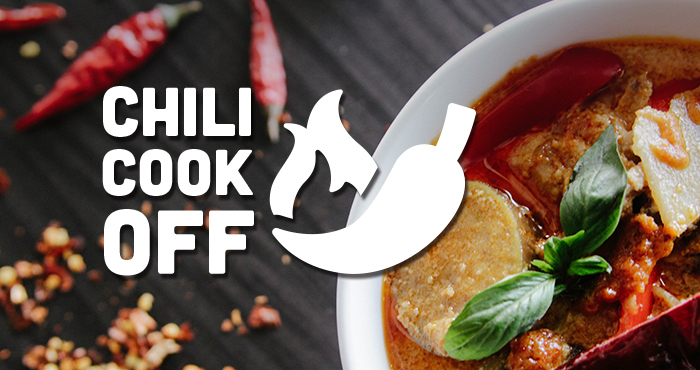 So put your culinary skills to the test and bring a crock pot full of your favourite chili on Sunday, January 13, and let the competition begin! To register to be a chili cook-off competitor, email Mimi at office@westheights.org.